I always feel guilty about the amount I spend on my nails so I’ve put together this 99p ebay essentials wishlist of nail art tools as 99p is a bargain! 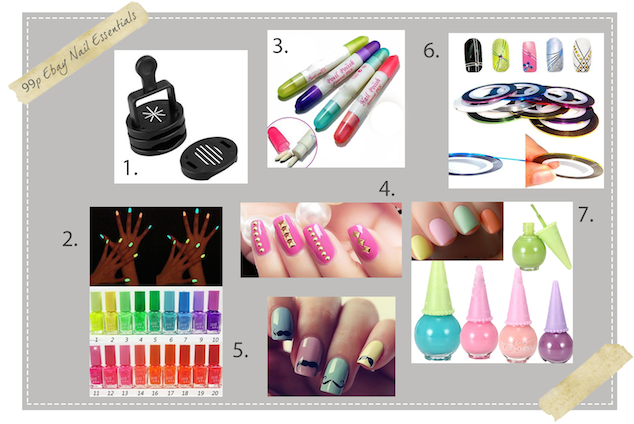 To start with in my list are the 3 Pattern Magnets for use with Magnetic Nail Polish. I love magnetic nail polishes but would love to be able to create different magnetic patterns on my nails with the same polish which this tool would allow. My second find are the Fluorescent Neon Glow In Dark Nail Polish. These look ace, great for nights out, bright, funky and glow in the dark! Third is something that I desperately need to invest in – a Corrector Pen Polish Remover. These pens are a way to quickly and mess free clean up your nails, all the polish that ends up on your fingers and round the sides of the nail. Simply use until they run out then refill with everyday nail polish remover. Number four are these Metallic Gold Stud nail stickers. These add a punk element to your nails and look fantastic on top of a striking nail colour. Fifth are Moustache Nail Transfer Stickers, a great way to jazz up your nails and add a bit of fun, who doesn’t like moustaches? Sixth is something that I recently bought and am waiting to arrive! :) Metallic Nail tape is used a lot at the moment to add a bit of sparkle and glamour to your nail designs. Can’t wait to give it a try! Pure Candy Color Ice Cream Shaped Nail Varnish round off this list. These cute bottles are fantastic and the pastel tone nail varnish is bang on trend.